A Truly Yours Digital Edition. . .A year ago Kayla Marceilo had it all - a great job in Boston and a handsome, successful fiance who loved the Lord...or so she thought. When Ty turned out to be a liar, Kayla's world awas shattered. Moving back home seemd like a good way to try to pick up the pieces. Just when she feels like everything's falling into place, Ty reappears in her life, claiming to have changed. But has he? Ty Lawrence is sorry for his past. Tragedy and heartache made him hit rock bottom and realize what truly matters. He's changed his ways and his hoping for a simpler, more meaningful life in Farrington...and another chance with Kayla. When Ty's past catches up with him and he's accused of defrauding his former company, can he ever earn Kayla's trust - and love - back? 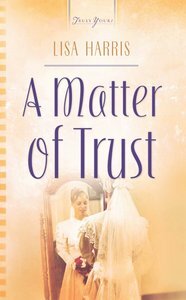 About "A Matter of Trust (#02 in Massachusetts Weddings Series)"
A year ago Kayla Marceilo had it all - a great job in Boston and a handsome, successful fiance who loved the Lord...or so she thought. When Ty turned out to be a liar, Kayla's world awas shattered. Moving back home seemd like a good way to try to pick up the pieces. Just when she feels like everything's falling into place, Ty reappears in her life, claiming to have changed. But has he? Ty Lawrence is sorry for his past. Tragedy and heartache made him hit rock bottom and realize what truly matters. He's changed his ways and his hoping for a simpler, more meaningful life in Farrington...and another chance with Kayla. When Ty's past catches up with him and he's accused of defrauding his former company, can he ever earn Kayla's trust - and love - back? When Lisa is not working she loves hanging out with her family, cooking different ethnic dishes, photography, and heading into the African bush on safari. For more information about her books and life in Africa visit her website at www.lisaharriswrites.com .